Kelvin was born William Thomson in Belfast in 1824. Son of a mathematics professor he was educated in Scotland at the University of Glasgow (entering when he was 10 years old) and Cambridge, where he graduated in 1845. He also spend a year working with Pierre and Marie Curie and Henri Bequerel in Paris. Thomson set-up the first dedicated Physics Laboratory in the United Kingdom at the University of Glasgow in 1846. For his impressive and wide ranging efforts to Science, including notable contributions to thermodynamics, electromagnetic theory, communication (first transatlantic cable link) and of course contact potentials, he was knighted in 1866 and received the title Baron Kelvin of Largs in 1892. 'Kelvin' was the name of a stream running through the University campus. The day after Kelvin formally retired from Glasgow University he enrolled as a student. 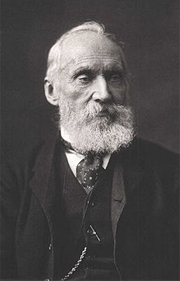 Lord Kelvin died in 1907 and was appropriately buried next to Issac Newton in Westminster Abbey. He published 661 papers, took out 70 patents and had more initials after his name than any other man in the British Commonwealth! The picture below shows a statue of Lord Kelvin that was erected in Glasgow to commemorate his achievements. Kelvin was one of the most gifted scientists of his generation. He was by all accounts a talented orator and was sufficiently confident in his experimental methods to incorporate public demonstration of his methods. It is perhaps fitting to reproduce a sketch of his original experimental arrangement which incorporating large plates of Copper and Zinc (which have clean work functions of 4.6 and 4.7 eV respectively) mounted on insulating shafts. I am indebted to Ing. Kees van der Werf, of the University of Twente, The Netherlands, who is both a skilled scientist and artist, for the reproduction. Kelvin detected the flow of charge, upon making electrical contact, using either the golf leaf electroscope shown here, or a more sensitive quadrant electrometer. A further development, using a home-made Daniel's cell, allowed nulling of the field between the plates. Remembering that this method pre-dated the discover of the electron by J. J. Thomson's (no relation to William) in 1905, Kelvin explained the effect of leaf separation using the terms 'resinous electricity' equating to the flow of positive charge and 'glasseous electricity' for negative charge. A diligent reporter of the physical world Kelvin described an additional phenomena he observed upon introducing a substance he had recently received from Henri Bequerel derived from Uranium ore pitchblende between the plates. He remarked that the electroscope immediately discharged indicating the presence of a conducting pathway between the plates. This last result is not surprising since the radiation given off by the decay of radium from the zincblende would ionize the air. This was not especially good news for the health of his audience and perhaps indicates why, at many notable British institutions, the senior members of staff tend to sit at the back of the auditorium especially for experimental demonstrations! Kelvin was 73 at the time of this demonstration and died of influenza 10 years later. Herni Bequerel was awarded the Nobel Prize in 1920 together with Marie and Pierre Currie on the discovery and isolation of radium from Uranium Ore. Marie Curie however suffered radiation burns in her study of radium.